Sports bobbleheads are popular but they’re not just for famous athletes. 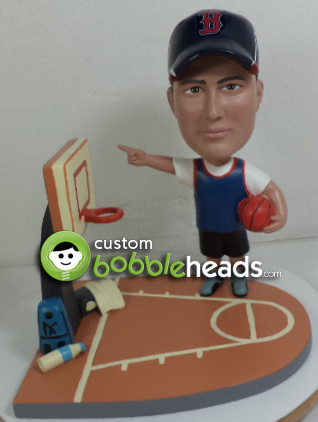 This basketball player bobblehead is also a Boston Red Sox fan. The custom base was made to look like a basketball court, complete with gym bag, towel, and water bottle. 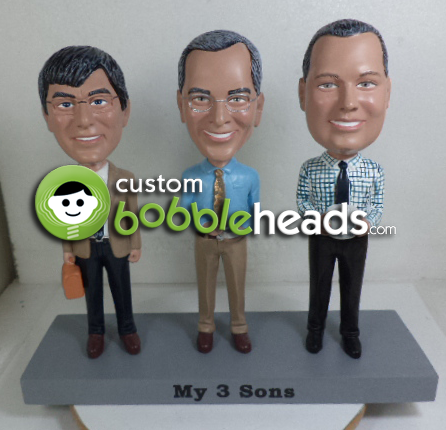 A custom bobblehead of three sons turned out to be the perfect Father’s Day gift. Of course, it would’ve worked quite well for Mother’s Day too. 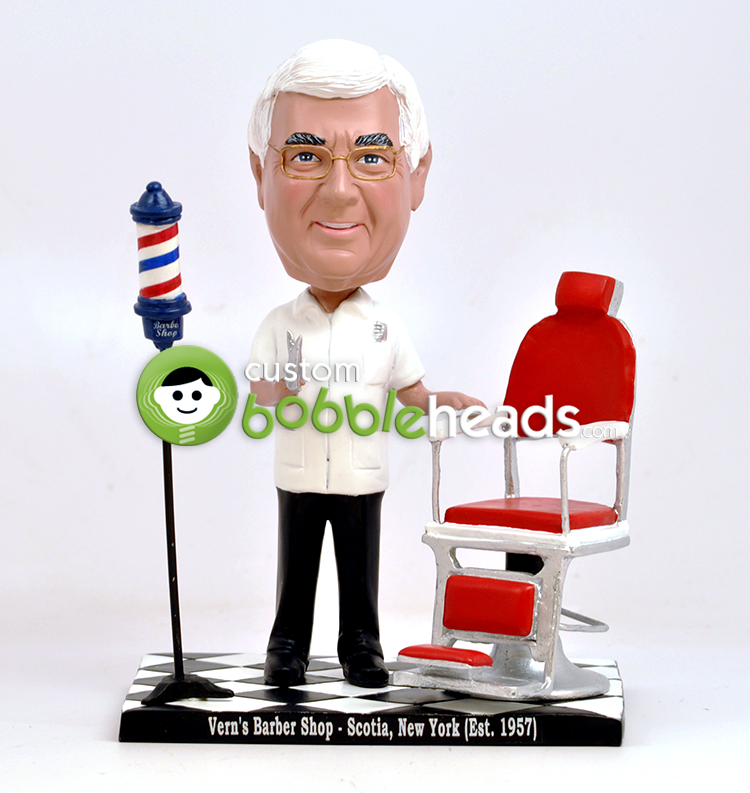 This custom bobblehead does a great job of capturing the essence of a classic barber shop, including barber’s chair, hair clippers, checkered floor, and even the barber’s pole. 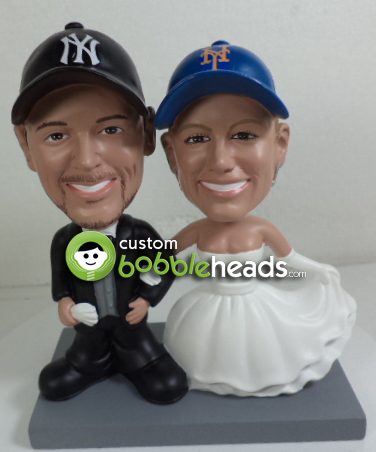 Here’s a custom bobblehead that proves love conquers all, even baseball rivalries. The couple decided to use their playful rivalry as a wedding cake topper. 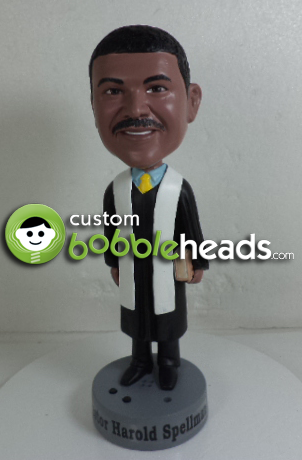 The individual who created this custom bobblehead of a local pastor chose to include a voice box for recording popular quotes and scripture. Custom bobbleheads aren’t limited to humans. 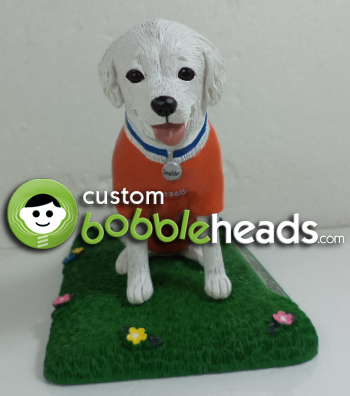 Pets are members of the family too and many families feel they deserve their own personal bobblehead. “Mr. Knucklehead” believes in safety first when riding his trusty tricycle. 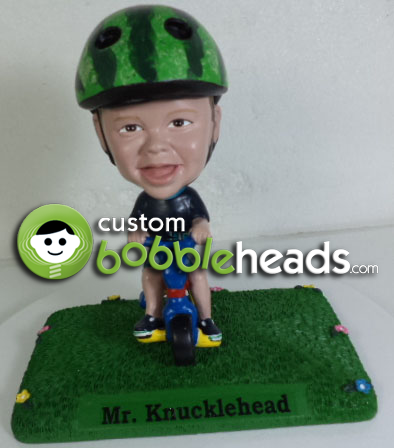 Custom bobbleheads are a great way to capture the milestones in a child’s life. There’s a special bond between a pet and their owner. 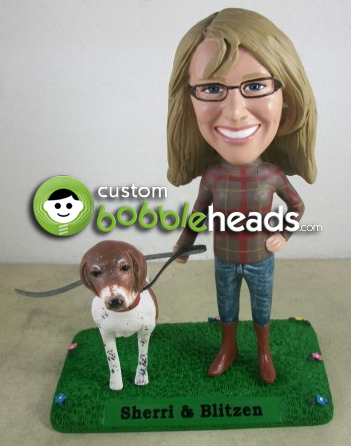 Many pet owners use custom bobbleheads as a way to symbolize the love for their furry companions. Sports fans love their teams. Custom bobbleheads are a creative and original way to show team/school spirit. Plus, they’re 100% custom so no other fan will have this unique piece of fandom. Here you have team colors, logos, pompoms, refreshments, and even a slogan on the base. Do you have a hobby like fishing or painting? 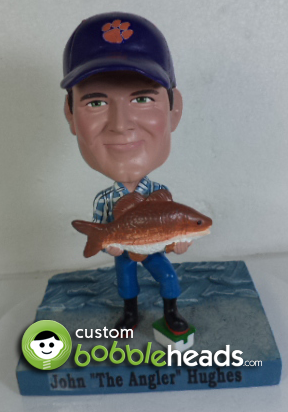 Capture your passion in life with a custom bobblehead like John “The Angler” Hughes and his awesome looking fish. Looking closer, you can see one foot resting on a tackle box. The detail is impeccable. 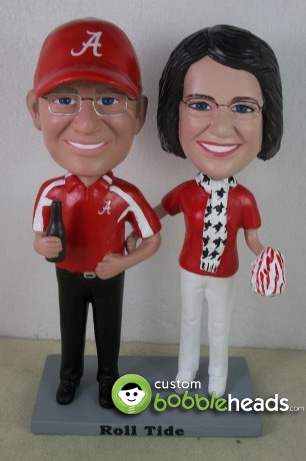 Custom bobbleheads make great gifts for all holidays and special occasions. 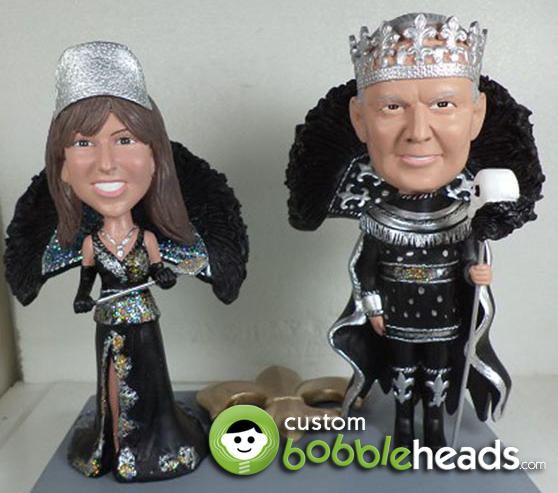 Here you see the Mardi Gras “King and Queen” immortalized as bobbleheads. Crowns, elaborate outfits, and the fleur-de-lis symbol on the base epitomize the flair and festive nature of such an event. 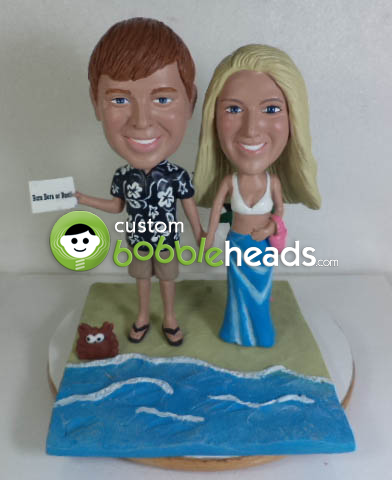 This bobblehead was created to commemorate a couple’s beach trip. 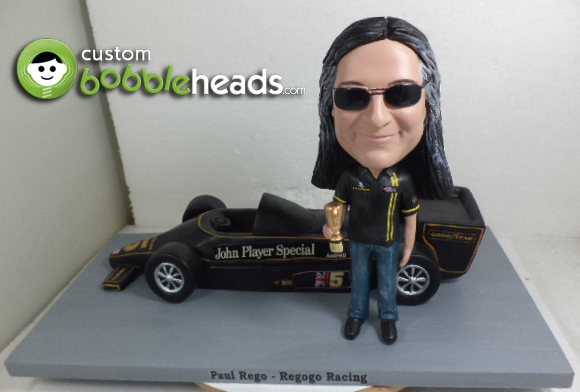 Some people like to have a custom bobblehead made to capture a special moment in time, including vacations. Think of it as a step up from pictures. “Forever and Always” says it all. 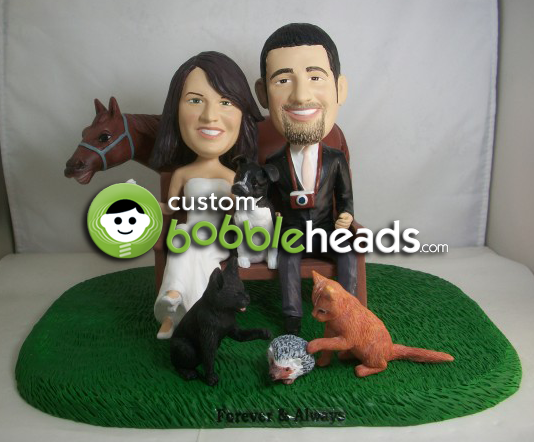 The custom base these newlyweds chose clearly reflects their love of animals. You can see dogs, cats, a horse, and even a porcupine. 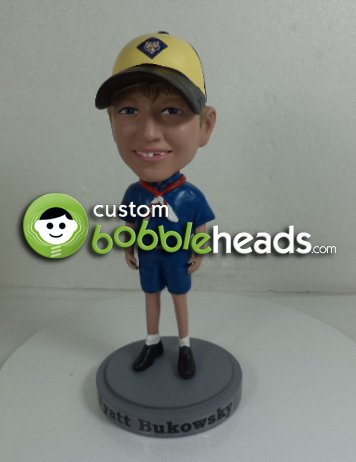 From Cub Scouts to youth sports, custom bobbleheads are a great way to celebrate your children’s accomplishments. It also gives them a personal and unique keepsake to cherish forever. The boy’s uniform detail is magnificent and his missing front tooth did not go unnoticed by our artists. 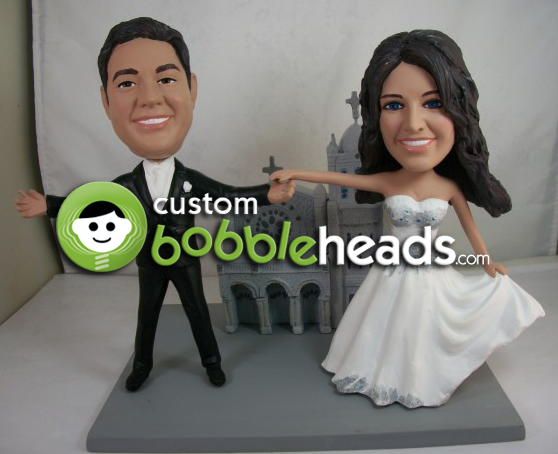 Custom bobbleheads can really spice up a wedding with some personal flare. Couples can use it as a cake topper or buy in bulk and give them out as wedding favors. It also makes a great gift for the bride and groom if you’re looking for something more personal and not on the registry. Here’s another example of an awesome custom base created for race car team. The Formula 1 car body-style is extremely accurate. Artists did a wonderful job on the logos and accessories as well, such as the man’s trophy.